This whitepaper from the SANS Institute focuses on the growing use and benefits derived from information technology (IT) and operational technology (OT) convergence which includes more effective management and operation of contemporary control systems. 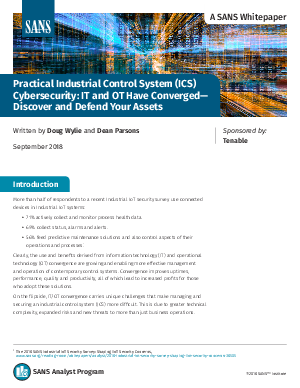 IT/OT convergence carries unique challenges that make managing and securing an industrial control system (ICS) more difficult. This is due to greater technical complexity, expanded risks and new threats to more than just business operations. This paper explores the issues that arise with the blending of IT and OT into combined cyber-physical systems where risks must be identifed and managed. -Why are digital asset inventories critical for IT/OT security risk management? -How does knowledge about risks and vulnerabilities to IT/OT systems lead to better risk management? -Can applying even a few of Center for Internet Security (CIS) Controls make a marked difference in the security posture of today’s control systems?